Ohanaeze Ndigbo has responded to President Muhammadu Buhari’s approval of payment of pension to police officers who served under the defunct Biafra police during the civil war. In 2000, the Police officers were granted presidential pardon, under the President Olusegun Obasanjo-led administration. The Pension Transitional Arrangement Directorate (PTAD) on Wednesday revealed that about 162 of such retired police officers and 57 Next of Kin will be paid their arrears in the first phase which kicks off this month. 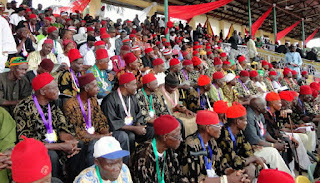 Consequently, President-General of Ohanaeze Ndigbo, Chief John Nnia Nwodo, reacted, saying that despite the good development, the approval was justice long overdue, as some of the beneficiaries are dead. He said: “It’s been 47 years since the war ended and many of the people who should benefit from this pension are dead already. That goes to show you how the South-East region has been marginalised and that is why we are harping on it.